At the end of 2018, Apple was able to confirm his suspicions. Sales of your iPhone in India have plummeted. There are several reasons for this failure , among which some polemics with the Hindu government stand out. But the biggest culprit of the fall in sales has been a smartphone from an Android brand. Apple's iPhone sales have fallen by nearly 50% compared to the previous year (2017). The company has sold "only" 1.7 million units of smartphones in 2018. But in 2017 the company sold 3.2 million units. The main culprit of the fall of sales of the iPhone in India is none other than the latest OnePlus model. While Apple has bitten the dust, OnePlus has seen its figures grow considerably in the Asian country. 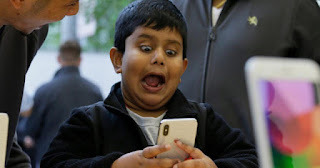 In fact, OnePlus has achieved a sales record in the third quarter of 2018. The brand holds more than 37% of the segment of premium smartphones in India. "THE PRICE OF MORE THAN $ 1,000 FOR THE NEW IPHONE MODELS - EVEN AFTER THE OFFERS - WAS TOO MUCH FOR CONSUMERS. SO THE IPHONE OF PREVIOUS GENERATIONS THAT USED TO DRIVE SALES VOLUME HAVE BEEN OVERTAKEN BY ANDROID FLAGSHIPS. " 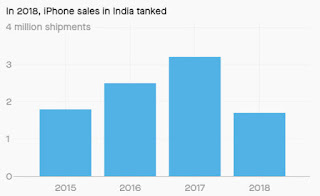 As you can see in the statistical chart, iPhone sales of 2018 in India have been even lower than those of the apple company bitten in 2015 . Tim Cook acknowledged in a letter to investors that iPhone sales have been very weak in some Asian countries, especially in China. As pointed out from QZ , to reduce costs, Apple has focused on more affordable iPhone, and starting to manufacture devices in India . This reduction in costs will help the company recover from the hard blow received with such low sales in this region. content material as you probably did, the internet might be much more useful than ever before.